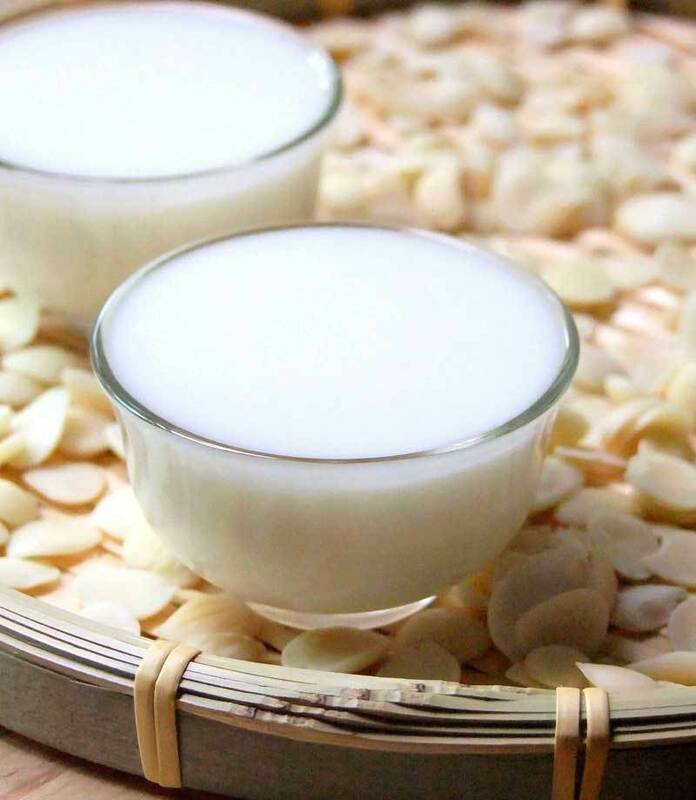 Chinese “almond” milk or Xing Ren Cha (杏仁茶/露) is a traditional Chinese drink. I remember it was my grandma’s favourite drink. With a distinctive smell, I used to hate it when I was young. Only lately that I started to appreciate it and learn to make it. For the namesake, most people thought that this drink is made from almond. However, the “almond” here actually refer to apricot kernels. In Chinese translation, both almond (Prunus amygdalus) and apricot (Prunus armeniaca) kernels are referred to as Xing Ren (杏仁), leading to the confusion. Apricot kernels have been used as both food and medicine in China for many centuries. 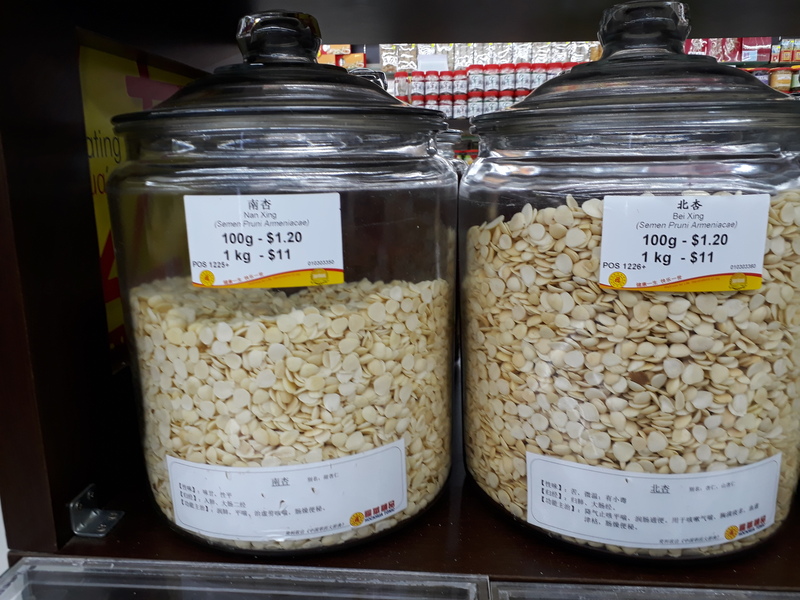 Traditionally, edible apricot kernels are classified into two types: Southern apricot kernels (Nan Xing, 南杏) and Northern apricot kernels (Bei Xing北杏). Interestingly, such classification is not based on the region of production, rather the taste of the apricot kernels. Southern apricot kernels taste sweet and are used in normal cooking, whereas Northern apricot kernels taste bitter and is used as a medicine. Both types of apricot kernels are widely available from Chinese herbal stores in Singapore and Malaysia. Drain the water and put the apricot kernels and brown rice into a bowl, add water until in cover the mixture. Steam the mixture for 20 minutes until it is cooked. Add the mixture into the high-speed blender. Add 600ml of hot water. Blend the mixture under high speed until smooth – the mixture will turn creamy white in colour. Pour the mixture into a saucepan and cook under medium heat. Serve it hot, sweeten with honey. Nutritionally, apricot kernels are high in fat (42-50%) . The fat in apricot kernels are mainly monounsaturated fatty acids, especially oleic acid (~70%) and linoleic acid (~20%) . Hence, it can be a good source of omega-9 and omega-6 fatty acids, which are known to be able to lower cholesterol level and reduce cardiovascular health risk  . The apricot kernel oil also contains a fair amount of vitamin E, a strong antioxidant for the body . The oil from apricot kernel is also reported to have anti-inflammatory  and anti-microbial effects . With 25% protein, apricot kernels can be used as an alternative source of proteins. 15-18% of apricot kernels consist of dietary fibres which are known to have protective effects against gastrointestinal diseases, obesity, diabetes, stroke, hypertension and cardiovascular diseases . A good amount of phosphorus, calcium, and iron is also found in the kernels, which are good for bone health . In Traditional Chinese Medicine (TCM), the functions of apricot kernels include moist the lung, stop coughing and ease constipation. Particularly, Northern apricot kernels are used as an expectorant to treat phlegmy cough and asthma. However, TCM also cautions that Northern apricot kernels should not be used in large dose (less than 10g) since it contains mild toxicity . The toxicity of Northern apricot kernels comes from a compound called amygdalin, a type of cyanogenic glycosides which can release hydrogen cyanide which is toxic to the human body. In fact, most seeds from the Prunus genus plants, including almonds, contain amygdalin to a various degree . Therefore, ingesting raw apricot kernels can be dangerous as it can lead to cyanide poisoning with symptoms such as hard to breath, hypotension, and even coma . Nonetheless, research has shown that amygdalin is able to induce cancer cell death, making it a promising anticancer drug  . Notwithstanding, it is unwise to believe in eating raw apricot kernels as a treatment for cancer due to its toxicity. Food processing can remove a large percentage of the amygdalin contents of apricot kernels . To lower toxicity, the Northern apricot kernels sold in the Chinese medicine stores have been dehulled. Through soaking, steaming, and boiling, the remaining toxic content of the apricot kernels can be removed. Hence, we can safely enjoy the Chinese “almond” milk for all its benefits with no worries. Cheers! G.N. Gabrial, F.I. El-Nahry, M.Z. Awadalla, S.M. Girgis, Unconventional protein sources: apricot seed kernels, Z Ernahrungswiss Suppl. 20 (1981) 208–15. S. Turan, A. Topcu, I. Karabulut, H. Vural, A.A. Hayaloglu, Fatty Acid, Triacylglycerol, Phytosterol, and Tocopherol Variations in Kernel Oil of Malatya Apricots from Turkey, J. Agric. Food Chem. 55 (2007) 10787–10794. doi:10.1021/jf071801p. P.J. Huth, V.L. Fulgoni, B.T. Larson, A Systematic Review of High-Oleic Vegetable Oil Substitutions for Other Fats and Oils on Cardiovascular Disease Risk Factors: Implications for Novel High-Oleic Soybean Oils, Adv. Nutr. An Int. Rev. J. 6 (2015) 674–693. doi:10.3945/an.115.008979. T. Kutlu, G. Durmaz, B. Ateş, A. Erdoğan, Protective effect of dietary apricot kernel oil supplementation on cholesterol levels and antioxidant status of liver in hypercholesteremic rats, J. Food, Agric. Environ. J. Food Agric. Environ. 77 (n.d.) 61–65. M. Minaiyan, A. Ghannadi, M. Asadi, M. Etemad, P. Mahzouni, Anti-inflammatory effect of Prunus armeniaca L. (Apricot) extracts ameliorates TNBS-induced ulcerative colitis in rats., Res. Pharm. Sci. 9 (n.d.) 225–31. http://www.ncbi.nlm.nih.gov/pubmed/25657793 (accessed November 7, 2016). H.-H. Lee, J.-H. Ahn, A.-R. Kwon, E.S. Lee, J.-H. Kwak, Y.-H. Min, Chemical composition and antimicrobial activity of the essential oil of apricot seed., Phytother. Res. 28 (2014) 1867–72. doi:10.1002/ptr.5219. S. Otles, S. Ozgoz, Health effects of dietary fiber., Acta Sci. Pol. Technol. Aliment. 13 (n.d.) 191–202. http://www.ncbi.nlm.nih.gov/pubmed/24876314 (accessed November 8, 2016). Apricot Seed (xing ren), (n.d.). http://www.acupuncturetoday.com/herbcentral/apricot_seed.php. N. Chaouali, I. Gana, A. Dorra, F. Khelifi, A. Nouioui, W. Masri, I. Belwaer, H. Ghorbel, A. Hedhili, Potential Toxic Levels of Cyanide in Almonds (Prunus amygdalus), Apricot Kernels (Prunus armeniaca), and Almond Syrup., ISRN Toxicol. 2013 (2013) 610648. doi:10.1155/2013/610648. B.N. Akyildiz, S. Kurtoğlu, M. Kondolot, A. Tunç, Cyanide poisoning caused by ingestion of apricot seeds, Ann. Trop. Paediatr. 30 (2010) 39–43. doi:10.1179/146532810X12637745451951. Y. Chen, J. Ma, F. Wang, J. Hu, A. Cui, C. Wei, Q. Yang, F. Li, Amygdalin induces apoptosis in human cervical cancer cell line HeLa cells, Immunopharmacol. Immunotoxicol. 35 (2013) 43–51. doi:10.3109/08923973.2012.738688. X. Xu, Z. Song, Advanced research on anti-tumor effects of amygdalin, J. Cancer Res. Ther. 10 (2014) 3. doi:10.4103/0973-1482.139743. G. Tunçel, M.J. Nout, L. Brimer, D. Göktan, Toxicological, nutritional and microbiological evaluation of tempe fermentation with Rhizopus oligosporus of bitter and sweet apricot seeds., Int. J. Food Microbiol. 11 (1990) 337–44. http://www.ncbi.nlm.nih.gov/pubmed/2282289 (accessed November 7, 2016).